The Bank of England made two decisions today. Firstly the bank decided to stop quantitative easing as they were happy with the £200 billion of government bonds that they already own. What is now going to be interesting to watch is what happens to government gilt prices and yields now that the government have lost a key buyer of their debt. In December alone the UK government needed to borrow £15.7 billion and I look forward to seeing where the buyers of all this debt are going to come from. The other thing that I look forward to is seeing if the Bank of England is ever going to be able to sell the government debt that they have already bought. Secondly the bank decided to keep the official bank rate on hold at 0.5% for the twelfth month in a row as I suggested they would on Tuesday. This is the lowest rates have been even if I look back to the year 1694. Even during the Great Depression the Bank Rate only went as low as 2%. My chart today shows the relationship between the official bank rate, the consumer price index (CPI) and the retail prices index (RPI). Normally, as you would expect, the correlation between the official bank rate and inflation is quite high. However currently the bank seem to have lost all interest in controlling inflation so while it heads skyward the bank rate flat lines. I’d really like to know their justification for this when the Monetary Policy Framework under which they operate includes “...Price stability is defined by the Government’s inflation target of 2%. 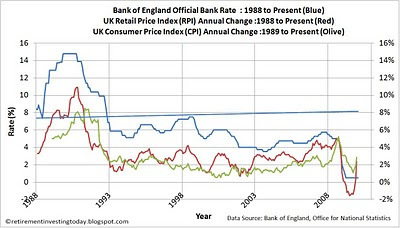 The remit recognises the role of price stability in achieving economic stability more generally, and in providing the right conditions for sustainable growth in output and employment.” I guess we’ll know Mervyn King’s thoughts when he writes a letter to Alistair Darling next month following the CPI heading over 3%.